Hello and welcome to the 349th installment of the SWD. 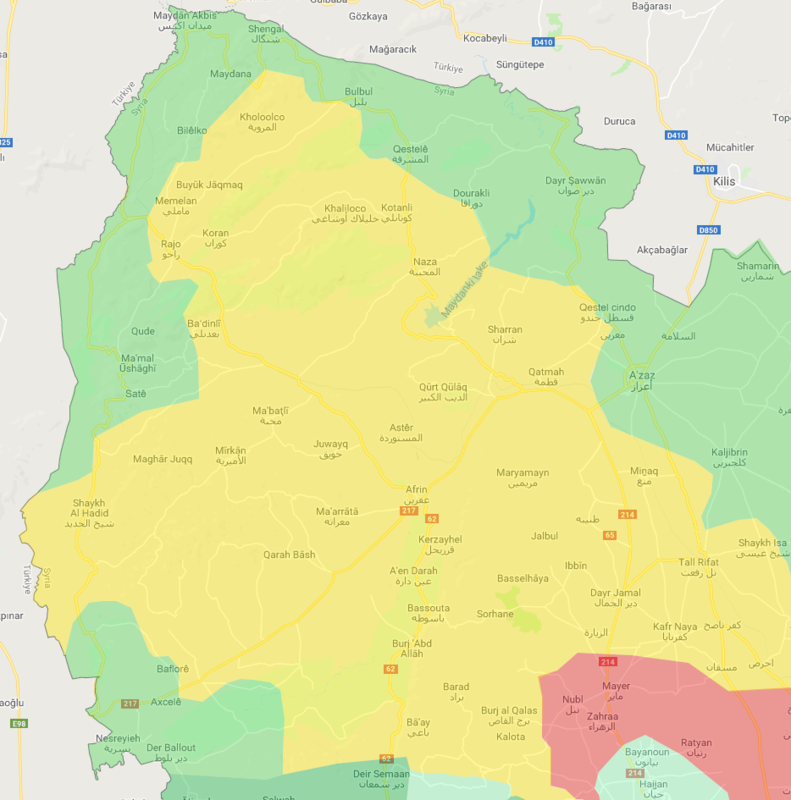 Turkey-backed Free Syrian Army, backed by Turkish Air and Land Forces captured one locality from the Syrian Democratic Forces’ YPG in Afrin region, as a part of the operation ‘Olive Branch’ (AR: Ghasin al-Zaytun, TR: Zeytin Dalı). Free Syrian Army captured Qarmanlaq in Shaykh al-Hadid subdistrict. 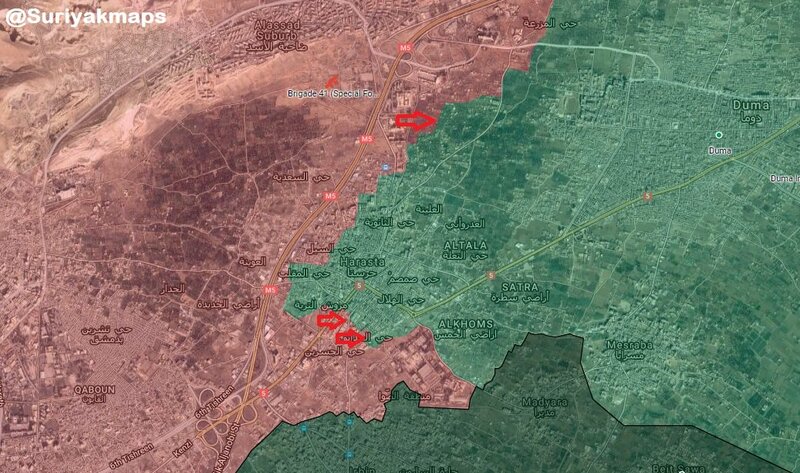 Several reports also suggest that the Free Syrian Army captured Senara al-Fawqani and Senara al-Tahtani, however, these reports should be taken with a grain of salt for now. Turkey-backed Free Syrian Army and Turkish Land Forces’ artillery shelled Haj Khalil village in Rajo subdistrict and Al-Rihaniyah village in Jindires subdistrict. According to the Syrian Arab News Agency, five civilians were killed by the shelling of Al-Rihaniyah. Jabhat Tahrir Suriya (Ahrar al-Sham and Harakat Nour al-Deen al-Zenki) captured Darat Izza, Bisrtoun, Batbou, Kafr Natin, and Jabal al-Sheikh Barakat from Hayat Tahrir al-Sham in the western Aleppo. Rebel elements in the western Aleppo formed Jaysh Halab al-Shahba (Jaysh Ibna al-Shahba according to some), under the command of Captain Amin. However, after its formation, Jabhat Tahrir Suriya threatened to fight the newly-formed group, as it allegedly harbors elements and commanders of Hayat Tahrir al-Sham. Captain Amin stated that the group does not contain any elements of Hayat Tahrir al-Sham and only aims to fight against the Syrian Arab Army and its allies. According to Captain Amin, the newly-formed group consists of around 600 fighters. Jabhat Tahrir Suriya reportedly captured Salwa, Qah, Atme, and Tarmanin from Hayat Tahrir al-Sham. After capturing Atme, Jabhat Tahrir Suriya handed over the locality to Faylaq al-Sham, in order to neutralize the locality from the infighting. Faylaq al-Sham released a statement announcing its neutrality in Jabhat Tahrir Suriya-Hayat Tahrir al-Sham infighting in Aleppo and Idlib governorates. Both parties involved in the infighting asked Faylaq al-Sham to join their side. Faylaq al-Sham’s statement said that the group does not accept “oppression, aggression and injustice in the Syrian revolution” and called the parties involved in the infighting to mediate the issue and think about the responsibility to protect civilians who have been targeted in the past few days. Similarly, the Uzbek group Imam Bukhari Battalion (Jamaat al-Bukhari) also issued a statement declaring neutrality in the recent infighting and called on other foreign fighters to not get involved in the infighting and focus on fighting the Syrian Arab Army. Hayat Tahrir al-Sham surrounded Jabhat Tahrir al-Sham-held village of Hazano in the northern Idlib. This development negates the statement of Hayat Tahrir al-Sham’s Ibaa News Agency, which claimed two days ago that the group is in control of the locality. Reports suggest that six civilians were killed by Hayat Tahrir al-Sham’s artillery shelling of Hazano, as the locality remains surrounded. Hayat Tahrir al-Sham and Jabhat Tahrir Suriya also clashed in Maar Shurin, south of Idlib. According to the reports, a civilian was wounded during the clashes between the two sides. Katibat al-Sadiq, led by Abu Mahmoud al-Tileada defected from Hayat Tahrir al-Sham and joined Jabhat Tahrir al-Sham. Unknown gunmen assassinated Hayat Tahrir al-Sham’s commander, Abu al-Yaman Halfaya on the road near Khan Sheikhoun (Shaykhun). Demonstrations were held in Kafr Nabl (Kafranbel), Jabla, Hoss, and Kafr Rumah against Hayat Tahrir al-Sham. The demonstrators raised the flag of the Free Syrian Army (Syrian National Coalition) in the localities and chanted slogans against Hayat Tahrir al-Sham and its leader, Abu Mohammad al-Jolani. Syrian Arab Army’s artillery, Syrian Arab Air Force, and Russian Air Force targeted Douma, Hazeh, Ain Terma, Harasta, and Al-Shifuniyah in the East Ghouta. According to the Syrian Civil Defense (The White Helmets), 13 civilians were killed by the targeting of Douma. Rebel forces in the East Ghouta shelled Al-Duwaileah, Sahet al-Tahrir, and Beirut and Aleppo streets in the city of Damascus. According to the Syrian Arab News Agency, one civilian was wounded by the shelling of Aleppo street. Syrian Arab Army reportedly made additional limited advances on the hospital front in Harasta against Ahrar al-Sham-led rebels. Jaysh al-Islam’s spokesman, Hamza Birqdar stated that the group managed to hit and damage Syrian Arab Air Force’s L-39 Albatros warplane with anti-aircraft guns. According to Birqdar, the warplane landed at Al-Dumayr Military Airport and started burning on the runway. Free Syrian Army’s Firqat al-Haqq, backed by Liwa Maedh ibn Jabal and Liwa Shuhada Nafiea, raided Islamic State-affiliated Jaysh Khalid ibn al-Walid’s positions on Kafr Alma front. Reports suggest that five elements of Jaysh Khalid ibn al-Walid and one element of the Free Syrian Army were killed in the encounter. Islamic State raided Al-Hashd al-Shaabi’s (Popular Mobilization Units) positions in the village of Miyah, east of Baqubah. According to the Islamic State’s Amaq Agency, one element of Al-Hashd al-Shaabi was killed and another wounded in the raid. Afghan National Security Forces killed 16 and wounded six elements of the Islamic Emirate of Afghanistan (Taliban) in Pashtun Kot district, according to the Afghan Ministry of Defense. Afghan National Security Forces killed three elements of the Islamic Emirate of Afghanistan in Chimtal district. Islamic Emirate of Afghanistan attacked seven Afghan National Army’s positions in Ali Abad district. According to the reports, seven elements of the Afghan National Army were killed and several wounded in the attacks. Afghan National Security Forces killed three and wounded three elements of the Islamic Emirate of Afghanistan in Alingar district. Islamic Emirate of Afghanistan attacked Afghan Local Police’s positions in Qarghayi district, killing three and wounding one element of the police. Islamic Emirate of Afghanistan’s improvised explosive device killed an element of the Afghan National Security Forces in Saydabad district. Afghan Local Police reportedly withdrew from a checkpoint at the outskirts of the city of Pol-e Alam, capital of Logar Province. Afghan National Security Forces killed three elements of the Islamic Emirate of Afghanistan and destroyed a vehicle in the province. Islamic Emirate of Afghanistan’s improvised explosive device destroyed Afghan National Security Forces’ motorcycle and killed two elements on board in the city of Khost. Islamic Emirate of Afghanistan’s sniper killed an element of the Afghan National Army in Musa Khel district. Afghan National Security Forces killed 19 and wounded 23 elements of the Islamic Emirate of Afghanistan in Ab Band and Giro districts, according to the Afghan Ministry of Defense. Afghan National Security Forces also destroyed several weapons depots and ammunition caches, as well as seized three motorcycles. Islamic Emirate of Afghanistan raided Afghan National Police’s checkpoint in the city of Ghazni, wounding two policemen. Similarly, an element of the Afghan National Police was killed and another wounded in a raid on a checkpoint in Ghazni. Afghan National Security Forces killed six elements of the Islamic Emirate of Afghanistan and destroyed a fighting position in Garmsir district. Islamic State assassinated an element of the Indian Police in Srinagar, capital of Indian Jammu and Kashmir state. Islamic State’s fighters assassinated an element of the Somali Police Force in Hawi Taku area of Afgooye, Lower Shebelle province.